This IBM® Redbooks® publication can help you install, tailor, and configure the new IBM PowerHA® Version 7.1.3, and understand new and improved features such as migrations, cluster administration, and advanced topics like configuring in a virtualized environment including workload partitions (WPARs). With this book, you can gain a broad understanding of the IBM PowerHA SystemMirror® architecture. If you plan to install, migrate, or administer a high availability cluster, this book is right for you. 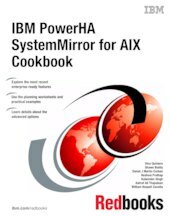 This book can help IBM AIX® professionals who seek a comprehensive and task-oriented guide for developing the knowledge and skills required for PowerHA cluster design, implementation, and daily system administration. It provides a combination of theory and practical experience. This book is targeted toward technical professionals (consultants, technical support staff, IT architects, and IT specialists) who are responsible for providing high availability solutions and support with the IBM PowerHA SystemMirror Standard on IBM POWER® systems.